We like the cut of Eevee’s jib. You see, other Pokemon are sort of locked into their niche. Pikachu is always an electric-type. Bulbasaur must always play the role of a plant-type. Charmander is always shackled to his role as a fire-type. Squirtle must always do the water thing. Eevee doesn’t have those limitations. If Eevee wants to play with fire, he just becomes a Flareon. Maybe he wants to cool off a bit by being a water-type Pokemon. Then he becomes a Vaporeon. Perhaps he wants to electrify the competition by shooting lightning bolts from his eyes! Well, then he just turns into a Jolteon. Eevee represents endless possibilities in the Pokemon games, and now you can too! 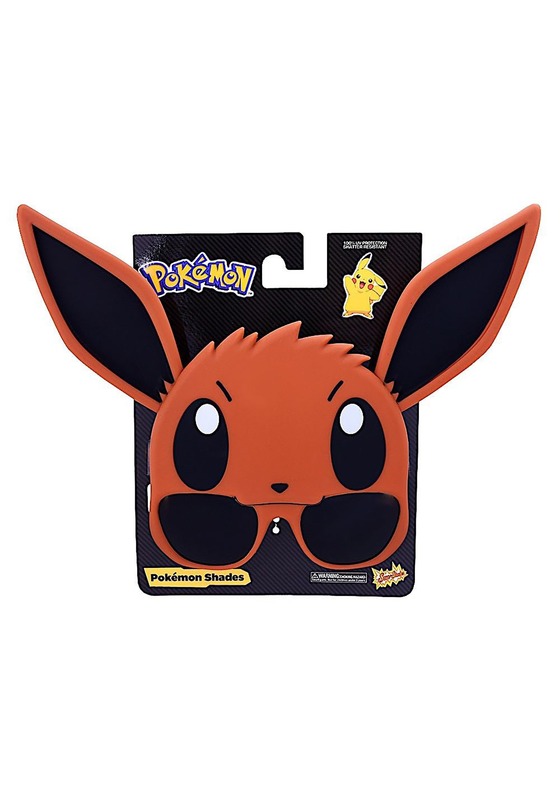 You can create a quick and easy Eevee cosplay costume with these officially licensed sunglasses. They’re designed to look like the iconic Pokemon and they even sport full UV protection. The lenses are shatter resistant, so you can head into a duel with other Pokemon with confidence! These Eevee sunglasses are an easy choice for any fan of the video game series. You can wear them as your everyday sunglasses for fun, or you can slip them on to complete your Pokemon costume. The possibilities are really limitless!